Lightweight, rigid and versatile. 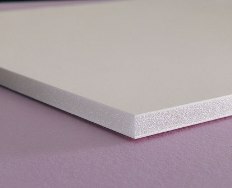 It's polystyrene core has built-in memory so cut edges return to their original thickness. It's clay coated paper is bonded front and back to provide an ultra-smooth surface for painting, printing and decorating. Eco-friendly. Meets U.S. Government requirements. Contains 35% post-consumer content. Sold in cartons only.